So Just Who's Running This Outfit - And What's It All About? Don't you just love these "Howdy Do!" pages? Either they're so formal and full of legalese that they make no sense, or they seem almost to be tongue-in-cheek. So, to try and keep this as brief and painless as possible, I'll try to find a middle ground here and get right to the point. 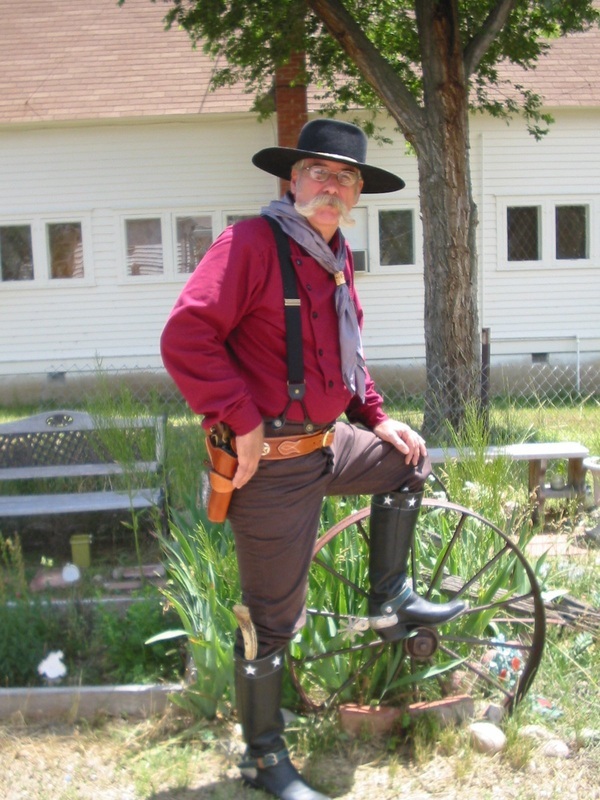 My name is Bob, and I am known throughout most of the John Wayne Internet World as "Colorado Bob." I guess you could say I'm the chief cook and bottle washer around here. I started this site as a fan club sort of deal, but that didn't pan out too well, and I realized that there was already a great group of folks doing that very same thing over at the John Wayne Message Board (where I have been a member since March 2005). So why try and re-invent the wheel? At that point I decided to change the focus of this website, and turn it into an internet repository of John Wayne information. A single website where you could go and research John Wayne to your hearts content, and find an answer to just about any question you might have about John Wayne. And so, the John Wayne Internet Database was born. If you are intent on finding any legalese stuff here, you'll have to scroll down to read that. It's almost as fun as watching paint dry, but not quite. I'm glad you're here, and I hope you'll bookmark the John Wayne Internet Database (aka: The New Frontier), and return here often! This website is dedicated first and foremost, to the memory of John Wayne. A man who epitomizes the Spirit of America. This website is also dedicated to Tim Lilley, Kevin Dolph, Newt/Cap'n Ralls (I don't know his "real" name), Jerry Hirsch, and all the others who have unabashedly declared their appreciation and respect of John Wayne across the width and breadth of the World Wide Web, video productions and in print. Some of you were pioneers in this regard, and some of you have firmly grabbed hold of the baton and carried it forward. All of you have helped to ensure that the memory of John Wayne will remain alive and active for generations to come. I only hope that I can in some small way measure up to the high standard you all have set. Thank you for everything. If you have an article, news, photograph, or other piece of information that you would like to share with the world through the John Wayne Internet Database website, please feel free to submit your piece for review via the "contact" tab on the navigation bar above. All submissions should be sent via email if at all possible. If this is not possible, and your submission should need to be mailed, the mailing address is: Robert Tuttle, P.O. Box 216, Max, Nebraska, 69037. All submissions are subject for review prior to their inclusion on this website. If your submission is accepted, your name will appear with your submission so as to ensure you are given proper credit. We do not pay for submissions, and all submissions are voluntary. Every effort will be made to return original submissions that sent via the USPS, however, no guarantees are made as to the certainty of their return due to possible circumstances beyond our control. This website is an "Unofficial" John Wayne website, and has no affiliation, official or otherwise, with Wayne Enterprises, although we do applaud the work they have done, and are continuing to do to keep the memory of John Wayne alive, as well as the wonderful life saving work they do through the John Wayne Cancer Clinic. Web Site Terms and Conditions of Use 1. Terms By accessing this web site, you are agreeing to be bound by these web site Terms and Conditions of Use, all applicable laws and regulations, and agree that you are responsible for compliance with any applicable local laws. If you do not agree with any of these terms, you are prohibited from using or accessing this site. The materials contained in this web site are protected by applicable copyright and trade mark law. This license shall automatically terminate if you violate any of these restrictions and may be terminated by The New Frontier - The John Wayne Internet Database at any time. Upon terminating your viewing of these materials or upon the termination of this license, you must destroy any downloaded materials in your possession whether in electronic or printed format. The materials on The New Frontier - The John Wayne Internet Database's web site are provided "as is". The New Frontier - The John Wayne Internet Database makes no warranties, expressed or implied, and hereby disclaims and negates all other warranties, including without limitation, implied warranties or conditions of merchantability, fitness for a particular purpose, or non-infringement of intellectual property or other violation of rights. Further, The New Frontier - The John Wayne Internet Database does not warrant or make any representations concerning the accuracy, likely results, or reliability of the use of the materials on its Internet web site or otherwise relating to such materials or on any sites linked to this site. 4. Limitations In no event shall The New Frontier - The John Wayne Internet Database or its suppliers be liable for any damages (including, without limitation, damages for loss of data or profit, or due to business interruption,) arising out of the use or inability to use the materials on The New Frontier - The John Wayne Internet Database's Internet site, even if The New Frontier - The John Wayne Internet Database or a The New Frontier - The John Wayne Internet Database authorized representative has been notified orally or in writing of the possibility of such damage. Because some jurisdictions do not allow limitations on implied warranties, or limitations of liability for consequential or incidental damages, these limitations may not apply to you. 5. Revisions and Errata The materials appearing on The New Frontier - The John Wayne Internet Database's web site could include technical, typographical, or photographic errors. The New Frontier - The John Wayne Internet Database does not warrant that any of the materials on its web site are accurate, complete, or current. The New Frontier - The John Wayne Internet Database may make changes to the materials contained on its web site at any time without notice. The New Frontier - The John Wayne Internet Database does not, however, make any commitment to update the materials. 6. Links The New Frontier - The John Wayne Internet Database has not reviewed all of the sites linked to its Internet web site and is not responsible for the contents of any such linked site. The inclusion of any link does not imply endorsement by The New Frontier - The John Wayne Internet Database of the site. Use of any such linked web site is at the user's own risk. 8. Governing Law Any claim relating to The New Frontier - The John Wayne Internet Database's web site shall be governed by the laws of the State of Nebraska without regard to its conflict of law provisions.